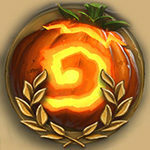 What’s Priest Losing in the 2019 Standard Hearthstone Rotation? The Priest class has been stuck in a weird place throughout the Year of the Raven. May it be Spiteful Priest in early 2018, Big Priest towards the end of the Standard year, or Topsy Turvy Priest after Boomsday release: most successful Priest archetypes didn’t really support the classic Priest class fantasy. Team 5 is still looking for new and exciting ways to redefine Priest as a whole, because healing in combination with high-value minions doesn’t seem to fit into the current Hearthstone design space anymore. Looking at the bright side, this design adventure led to multiple unique combinations and interactions within several Priest archetypes which many players grew fond of. Of course, Priest will lose quite a surprising amount of these combinations and interactions – but which archetypes can survive without them, and what cards could emerge from the bottom list of the power rankings to support existing or form completely new archetypes? Let’s cut right to the chase: The loss of both Radiant Elemental and Shadow Visions hurts Priest in every single possible way. Ever since Un’Goro had been released, almost all Priest lists relied on finding and replaying spells. Cycling through your deck to find combo pieces or survival tools has been an essential way to play the class and its archetypes. And if that wasn’t enough already, Un’Goro takes Lyra the Sunshard with it. 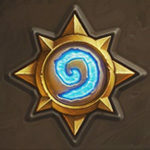 Just before the release of Un’goro, Mike Donais, Principal Game Designer for Hearthstone, warned the community about Lyra could be “too good of a card”, and he has been almost right about that. From a design standpoint, this card has been the nuts for Priest. It was able to serve as a panic button in high-pressure situations where you had to find additional combo pieces or healing, as a card-drawing perpetuum mobile, or – in the “worst” case – just as a 5-mana 3/5 on curve that had to be dealt with immediately. Either way, Lyra the Sunshard has been a primeexample of excellent Priest card design, and it will be sorely missed. Apart from those three big blows, every other Un’Goro class card has seen play in the last two years: First and foremost Awaken the Makers, one of the least interactive Quest cards, featured in Deathrattle Priest, a very weird archetype overall, as well as in several iterations of the late Topsy Turvy Priest list. Most Deathrattle-centric lists also featured Crystalline Oracle, Curious Glimmerroot and Tortollan Shellraiser, three very important early-game value minions. Mirage Caller has been one of the key combo pieces in early iterations of Velen OTK Priest decks, Free From Amber saw play in lots of control-heavy archetypes, and Binding Heal served as a survival tech card in Highlander Priest. 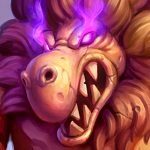 Losing neutrals Tar Creeper or Primordial Drake may hurt the average player, but Priest fans will already have lost their minds after waving goodbye to all of those ten class cards. And another “fun” fact to extend their misery: All Un’goro Priest cards on hearthstonetopdecks average a combined card power level rating of 4.1, which should be the highest rating overall for any card class expansion set. Finally some good news: Not every single KotFT Priest card has seen play, so Priest players won’t miss all of them. Hooray. Shadowreaper Anduin is the most important victim of the KotFT rotation: undoubtedly one of the most powerful Deathknight Hero Cards, Anduin – in combination with Raza the Chained – served as the foundation for one of Priest’s most iconic archetypes, Highlander Priest. The amount of removal and raw damage it provided made Priest much more versatile against all types of opponents, may it be control or aggro. After the rotation of Raza, Anduin has still seen play in almost every Priest archetype, making it an incredibly important part of the Priest collection. KotFT also paved the way for the Big Priest archetype: Spirit Lash, Eternal Servitude, Shadow Essence and Obsidian Statue see play in lists that make use of Priest’s tools to cheat out and resurrect big powerful minions. The usual honorable mentions go to Prince Keleseth as well as The Lich King, which both have been included in several Priest archetypes. Similar to Un’Goro, KnC helped all Priest archetypes to obtain new tools. The most prominent card that Priest will lose is Duskbreaker. 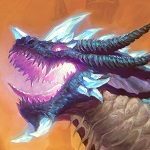 The minion elevated Dragon Priest into the upper echelons of competitive Hearthstone, and together with Twilight Acolyte and tons of additional Dragon-based synergy it revolutionized the way to build Priest decks. And while Dragon Priest lists haven’t been as popular these days, the “Dragon package” surely will leave a striking mark in the Priest collection. Another big hit for Priest will be the loss of Lesser Diamond Spellstone, one of the staples in the spell-based Big Priest archetype. The single-most important KnC card that leaves the Standard format for Priest, however, will be Psychic Scream. Hands-down the best Priest control tool there ever was – not last because of Shadow Visions -, one can only hope that it will be replaced by a similarly powerful surival spell for the Priest class. 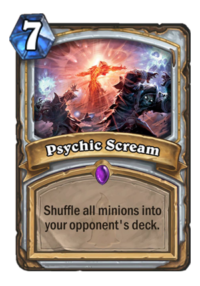 The power level will decrease throughout all classes after the rotation, but imagining Priest without Psychic Scream right now should make not only Priest fans worry alot. In the neutral section, Priest will lose signature minions like Spiteful Summoner and Grand Archivist, which have been staples in several Spiteful Priest iterations. The general Hearthstone design philosophy in the last years showed that expansions just partly introduce new archetypes, and Rastakhan could’ve done exactly that for Control Spell Priest. Both Grave Horror, Seance and Mass Hysteria have already seen play in the Year of the Raven, and in combination with the strong Priest spell toolkit they could make a sensational comeback with the upcoming Standard rotation. As mentioned earlier, Big Priest loses a ton of viable spells and minions. Nontheless, cards like Zerek's Cloning Gallery and powerful Classic set minions like Malygos or Prophet Velen still remain, and we all know that Priest has always managed to evolve into some sort of OTK archetype around everybody’s favorite Mind Blast in one way or the other. In terms ot OTK viability, the Priest spell toolkit is unmatched to this day. Yes, Topsy Turvy Priest in particular loses important cards like Radiant Elemental and Shadow Visions, but we could still see a similar iteration of the deck, just because not a single key combo card will leave Standard. The Test Subject/Topsy Turvy interaction was a unique design decision and could pave the way for several new Combo Priest iterations. It is very hard to predict a completely new archetype, but in terms of power level, the interaction between the Rastakhan cards Bwonsamdi, the Dead, Princess Talanji and Spirit of the Dead could spark the invention of a new control-heavy Priest archetype that includes massive board swings by producing countless 1-mana minions while controlling the board with powerhouse spells like Mass Hysteria. Julian "Tharid" Bischoff, a dinosaur in the fast-changing world of esports and self-proclaimed Warcraft expert, already created Hearthstone-related content for Red Bull, ESL and Hearthhead. Check out Tharid on Twitter! Priest is the most anoying class in HS. I will miss the joy of Archbishop Benedictus quest priest mirror match up, where both players waste each others times. I will miss many priest cards so much :(. 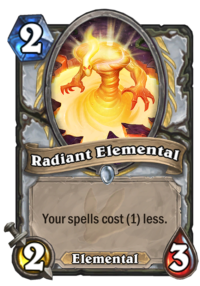 No more infinite Lyra value with double Radiant. No more fun Gallery pulls with double MindBlast OTK. So many removal/board clears will rotate. 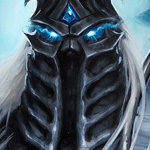 And my all favorite DK Anduin will leave the stage too…. Priest my personal favorite class at the moment. I will miss a lot of funny interactions. I hope Maly and Velen will find their place again in any sort of combodeck, cause Gallery Priest might be still a Thing, and cause i have them golden lol. Grave Horror/Inner Fire Priest sounds really funny with Seance. But Shadow Visions will leave too. So no more additional copys of any spells. Lets hope the upcoming expansion brings the fun back. Perfect! Nice article contains all the player need! Nice article, we´ll see what brings new expansion in term of AoE´s…But wild mode will be priested soon i guess. Thanks! Priest and AoE is a problem, yes. Psychic Scream was a very Priest-like solution, and I expect something very similar in the first or second expansion of 2019.